Despite sharing 98% of our DNA with chimpanzees (Pan troglodytes), humans (Homo sapiens) have much bigger brains and are as, a species, much more intelligent. A research team led by Reseacher Tomoko Sakai, Primate Research Institute, Emeritus professor Akichika Mikami (Now, professor of Chubu Gakuin University), Associate professor Mie Matsui, University of Toyama, Associate professor Ludise Malkova (Georgetown University), and ProfessorTetsuro Matsuzawa, Primate Research Institute explain why humans have a so much bigger brain than our nearest living relatives do, and provide clues about unique features of human intelligence. They tracked the development of cerebral tissues in growing chimpanzees during infancy and the juvenile stage, using three-dimensional magnetic resonance imaging and compared it with that of humans and rhesus macaques (Macaca mulatta). Overall, cerebral development in chimpanzees showed less maturity and a more protracted course during prepuberty, as also observed in humans but not in macaques. However, the rapid increase in cerebral total volume and proportional dynamic change in the cerebral tissue that occurred in humans during early infancy, when white matter volume increases dramatically, did not occur in chimpanzees. Thus, a dynamic reorganization of cerebral tissues of the brain during early infancy, driven mainly by enhancement of neuronal connectivity, is likely to have emerged in the human lineage after the split between humans and chimpanzees and to have promoted the increase in brain volume in humans. These results are reported in Proceedings of the Royal Society B (online) on December 18, 2012. Elucidating the differences in the ontogenetic mechanism underlying brain structure between humans and non-human primates will provide important clues to clarify the remarkable brain enlargement and unique human intelligence observed in modern humans. Recently, an increasing number of studies have used three-dimensional magnetic resonance imaging (MRI) to determine ontogenetic changes in grey matter (GM) and white matter (WM) volumes in humans and monkeys. However, the underlying ontogenetic process governing the remarkable brain enlargement observed in modern humans remains unclear, because the developmental trajectory of the WM and GM volumes of the cerebrum has not been explored in our closest living primate relatives, the chimpanzees. Moreover, because of a US moratorium on acquiring new chimpanzees for medical research, researchers who were trying to understand chimpanzee brain development had to study decades-old baby chimpanzee brains that were lying around in veterinary pathologists' laboratories. Thus, to address this lack of information and obtain empirical evidence for the remarkable enlargement of the human brain during the postnatal period, they tracked the development of the cerebral tissues in growing chimpanzees from infancy to the juvenile period using three-dimensional MRI (Figure 1) and compared these results with previously recorded data from humans and rhesus macaques. Figure 1. An ontogenetic series of MRI images of the whole cerebrum in a chimpanzee brain during early infancy and the juvenile stage. (a) MRI scanning of the brain of a chimpanzee infant (Ayumu) at age of six months. (b) MRI brain images aligned by age are shown for a representative young chimpanzee (Pal) and an adult chimpanzee (Reo) for comparison. (i) T1-weighted anatomical brain images. (ii) Segmentation of the cerebrum: grey matter (GM), white matter (WM) and cerebrospinal fluid (CSF). (iii) Three-dimensional renderings of the cerebrum from superior and right and left lateral views. The colored bar to the left of the images indicates the developmental stage based on dental eruption and sexual maturation. The indicated developmental stages in chimpanzees are early infancy (magenta), late infancy (yellow), juvenile (green) and adult stage (purple). Chimpanzees and humans differed from macaques in showing less maturity of brain volume after birth and prolonged development of the total and WM volumes of the cerebrum. The total volume in chimpanzees at the middle of early infancy (six months) was 73.8% of the adult volume (figure 3a). The corresponding value in humans at approximately the same developmental period (1 year) was 74.2% (figure 3b). By contrast, the total cerebral volume of macaques had already reached a plateau at the middle of early infancy (three months; figure 3c). However, interestingly, the rate of increase in total volume of the chimpanzee cerebrum during early infancy was only half that of humans. The total volume of the chimpanzee cerebrum increased by 8.4% from the middle of early infancy until the end of early infancy (six months to 1 year; figure 2a), whereas the total volume of the human cerebrum increased by 16.4% during approximately the same developmental period (1–2 years; figure 2b). By contrast, the total volume of the macaque cerebrum increased by only 1.6 % during approximately the same developmental stage (three to 4.8 months; figure 2c). Figure 2. Evaluation of total, GM and WM volumes in the cerebrum during early infancy and the juvenile stage. 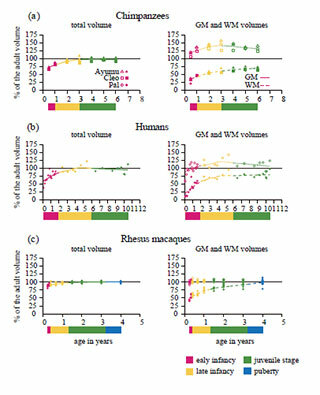 Age-related changes in the total, GM and WM volumes in the cerebrum are shown for (a) chimpanzees (Ayumu, Cleo and Pal), (b) humans (n=28) and (c) rhesus macaques (n = 6).The colored bar below the graphs indicates the developmental stage based on dental eruption and sexual maturation. The indicated developmental stages are early infancy (magenta), late infancy (yellow), juvenile (green) and puberty (blue). Figure 3. Evaluation of total, GM and WM volumes relative to the adult volumes in the cerebrum during early infancy and the juvenile stage. 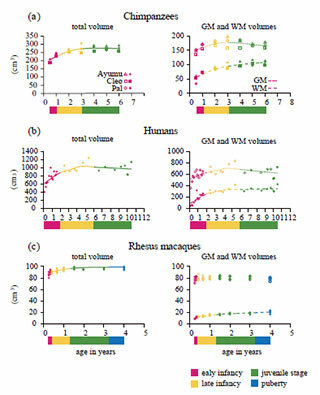 Age-related changes in total, GM and WM volumes relative to the adult volumes in the cerebrum are shown for (a) chimpanzees (Ayumu, Cleo and Pal), (b) humans (n=28) and (c) rhesus macaques (n=6). The colored bar below the graphs indicates the developmental stage based on dental eruption and sexual maturation. The indicated developmental stages are early infancy (magenta), late infancy (yellow), juvenile (green) and puberty (blue). This great difference in the developmental patterns of the total volume of the cerebrum during early infancy between chimpanzees and humans appears to be caused by differences in the developmental patterns of brain tissues during this stage and to greatly influence the ultimate difference in the adult brain volume between the two species. To verify this possibility, they attempted to evaluate the relative growth of the GM versus the WM of the developing chimpanzee cerebrum. Like humans, chimpanzees substantially differed from macaques in the proportions of brain tissues of the cerebrum at an early developmental stage. At the middle of early infancy (six months), the ratio of GM relative to WM of the cerebrum in chimpanzees was 3.51 (figure 4a). The corresponding value in humans at approximately the same developmental stage (1 year) was 3.29 (figure 4b). By contrast, the ratio of GM relative to WM of the macaque cerebrum at approximately the same developmental stage (three months) was only 1.93 (figure 4c). However, the ratio of GM relative to WM of the cerebrum in chimpanzee infants developed along a slower trajectory during early infancy compared with that of human infants. The ratio of GM relative to WM of the chimpanzee cerebrum changed from 3.51 to 3.18 from the middle of early infancy to the end of early infancy (six months to 1 year; figure 4a). By marked contrast, in humans, the ratio changed from 3.29 to 2.05 during approximately the same developmental stage (1–2 years; figure 4b). In macaques, the ratio of GM relative to WM of the cerebrum changed only from 1.93 to 1.82 during approximately the same developmental stage (three to 4.8 months; figure 4c). These results suggest that human infants exhibit a more dynamic proportional change in brain tissues during early infancy. Figure 4. Evaluation of the ratio of GM volume to WM volume in the cerebrum during early infancy and the juvenile stage with that in adults. 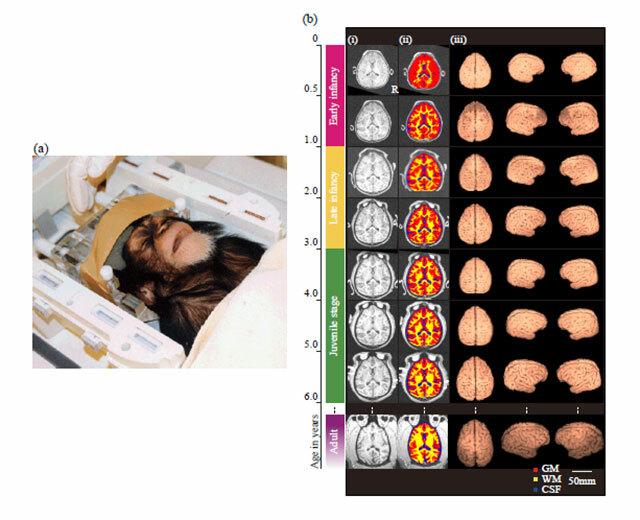 Age-related changes in the growth velocity of tissue volumes in the cerebrum are shown in (a) chimpanzees (Ayumu, Cleo and Pal), (b) humans (n=28) and (c) rhesus macaques (n=6). The coloured bar below the graphs indicates the developmental stage based on dental eruption and sexual maturation. The indicated developmental stages are early infancy (magenta), late infancy (yellow), juvenile stage (green) and puberty (blue). Although they observed that GM and WM volumes of the cerebrum increased during early infancy both in chimpanzees and humans, they demonstrated that this difference is attributable to differences between the species in the rate of WM volume increase during this developmental stage. The GM and WM volumes of the chimpanzee cerebrum increased by 5.2% and 17.2%, respectively, over the developmental period from the middle of early infancy to the end of early infancy (six months to 1 year; figure 2a). By contrast, the corresponding values increased to 8.4% and 42.8%, respectively, during approximately the same developmental period (1–2 years) in humans (figure 2b). In macaques, no significant age-related change in the GM volume of the cerebrum occurred during the study period (three months to 4 years; figure 2c). The WM volume of the macaque cerebrum increased only by 9.4% from the middle of early infancy to the end of early infancy (three months to 4.8 months; figure 2c). The team concluded that, a dynamic reorganization of cerebral tissues of the brain during early infancy, driven mainly by expansion of WM is likely to have emerged in the human lineage after the split between humans and chimpanzees and to have promoted the increase in brain volume in humans. Moreover, the enhancement of neuronal connectivity may also explain why experiences during the first few years of life can greatly affect children's long-term behavioral and cognitive development. Sakai T, Matsui M, Mikami A, Malkova L, Hamada Y, Tomonaga M, Suzuki J, Tanaka M, Miyabe-Nishiwaki T, Makishima H, Nakatsukasa M, Matsuzawa T. Developmental Patterns of Chimpanzee Cerebral Tissues Provide Important Clues for Understanding the Remarkable Enlargement of the Human Brain. Proc Biol Sci. 2012 Dec 19; 280(1753):20122398. Print 2013. This work was financially supported by grants (nos 16002001, 20002001 and 2400001 to T.M.) from the Ministry of Education, Culture, Sports, Science and Technology (MEXT), Japan, by the Global Centre of Excellence Programme of MEXT (A06 to Kyoto University), by a Japan Society for the Promotion of Science grant-in-aid for Young Scientists (no. 21-3916 to T.S. ), the Kyoto University Research Funds for Young Scientists (start-up to T.S.) and by WISH grant to KUPRI.